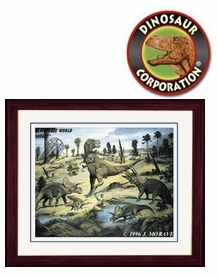 Prehistoric Dinosaurs T-rex Triceratops Picture Framed 17" x 14"
Home | Prehistoric Dinosaurs T-rex Triceratops Picture Framed 17" x 14"
Prehistoric Dinosaurs T-rex & Triceratops Picture Framed 17" x 14"
Prehistoric dinosaur art picture featuring T-rex and Triceratops is framed in 17" x 14", double matted in glass. It is a perfect dinosaur wall art decoration to you kids dinosaur room. RANGE - USA Colorado, Montana, N. Dakota, New Mexico, Wyoming. Canada Alberta, Saskatchewan. TIME - 70 - 65MYA, Late Cretaceous period.s remains were first discovered in 1887 (Wyoming, USA). RANGE - USA Montana, N. Dakota, S. Dakota, Colorado, Wyoming Canada-Alberta, Saskatchewan. SIZE - At least 25ft(8m) long. WEIGHT - 2 US tons.